The Fennec Turbine is a state of the art and technology compact wind turbine with low noise, high safety, and long use. The heart of the technology is a unique hyperboloidal rotor which provides the lowest noise and vibrations. From the art point of view—this is the new dimension for well-known works with hyperboloidal shells of famous Russian engineer, Vladimir Shukhov (1853 – 1939). The project moves his works from the static to dynamics. 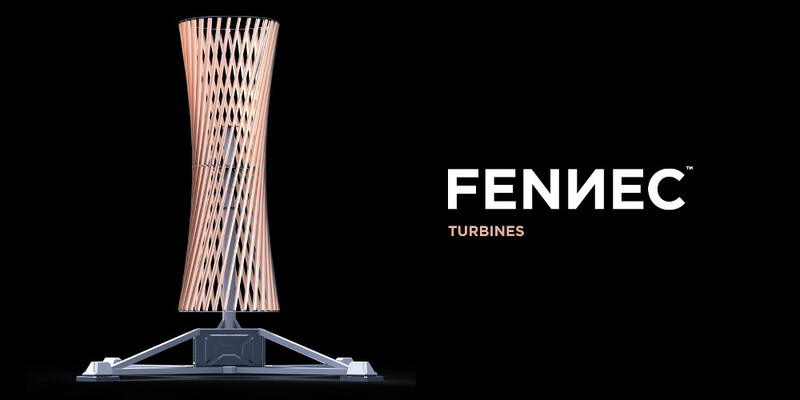 The Fennec Turbine is on the cutting edge between architecture and machines. A lot of work was done to find the perfect form for low kinetic impact and low noise rotor whose productivity will be comparable to the modern wind turbine. Also, after the basic solution was found, much more work was done in the field of aerodynamical optimization to discover and determine the exact values of the parameters and reach the efficiency of the whole system, from mechanical power of wind stream to battery bank, of 17%, which is not far off the 22% efficiency of best huge wind turbines produced by Siemens and GE. And the Fennec project is just getting started, so there are a lot of improvements planned. Maxim Kuzin (RU) holds an aerospace engineer degree from Moscow State Aviation Institute (MAI) since 2012. He is the CEO and founder of ATOM design bureau (CJSC “Experimental Design Bureau ATOM”, okbatom.com). From 2013 – 2014 he was the project manager and general engineer of Tram R1 okbatom.com/projects/r1. He is a college teacher and course author—”Basis of the theory of mass production”—at MAMI, Moscow Polytechnic University. Maxim Kuzin aimed to square the circle: Merging beauty, sustainable use, and longevity under harsh conditions. He succeeded by creating the Fennec Turbine. It carries on the best Russian traditions, because it works everywhere, under all conditions, without maintenance and it has a deeper purpose of making our world more sustainable. Inspired by a hyperboloid shell structure from the Russian past, Kuzin transferred it from a static plane to a full-fledged dynamic space using supercomputing powers and futuristic alloys from aviation. The resulting structure made of aluminum blades with an optimal airfoil profile looks more like an almost weightless sculpture or a precious vase. Yet it is inherently practical, would look beautiful on every urban roof, and produces power in conditions under which other products cannot work effectively. The STARTS Jury gave Maxim Kuzin an Honorary Mention and sees his project as truly European.